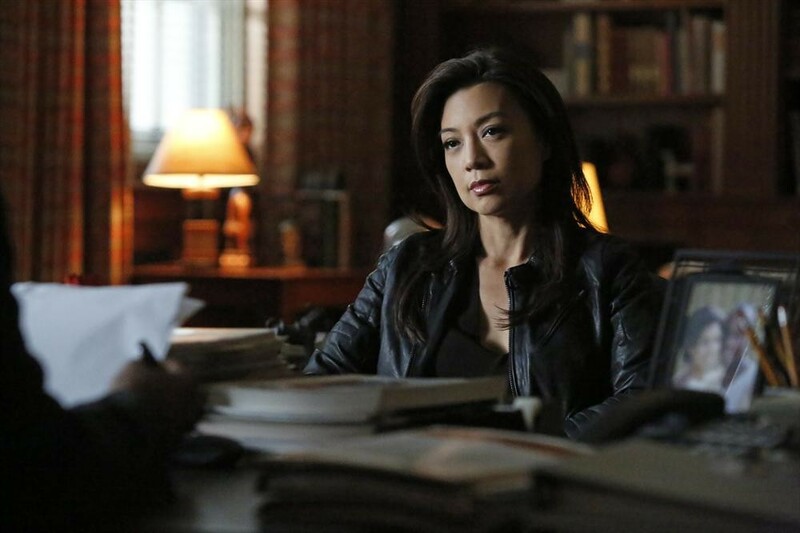 Critics At Large : Late-in-Life Renaissance: Marvel’s Agents of S.H.I.E.L.D. Late-in-Life Renaissance: Marvel’s Agents of S.H.I.E.L.D. 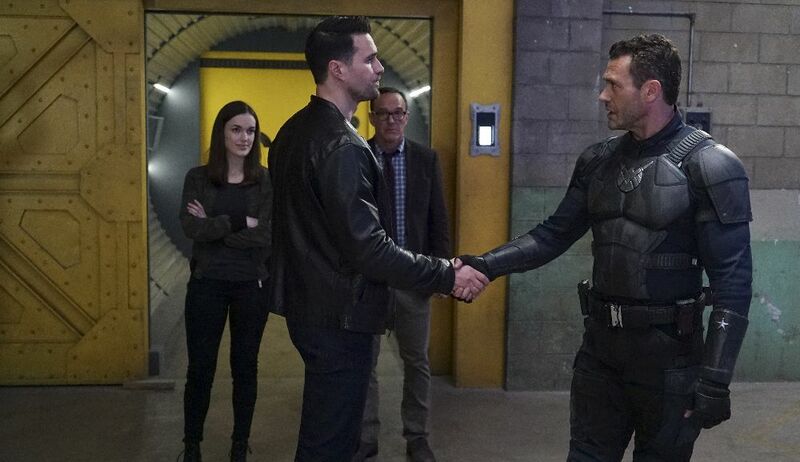 Brett Dalton and Jason O'Mara (foreground), with Elizabeth Henstridge and Clark Gregg (background) in a scene from the 4th season of Marvel's Agents of S.H.I.E.L.D. Every once in a while, I find myself stopping in the middle of an episode of television and asking (occasionally aloud): “Why am I still watching this?” It’s a question that I’ve wrestled with before on this site, and one that has sometimes nagged me throughout the run of Marvel’s Agents of S.H.I.E.L.D., which is in the final episodes of its fourth season on ABC. Originally conceived as a spin-off of Marvel’s juggernaut superhero franchise, the show boasted an impeccable lineage, as it was a co-creation of Avengers director and Buffy the Vampire Slayer creator Joss Whedon, his brother Jed, and his sister-in-law Maurissa Tancharoen. The show also featured Clark Gregg, rather implausibly reprising his role as Agent Phil Coulson, who served as a liaison between his shadowy organization and its super-powered allies and who appeared to have met an untimely fate in the first Avengers movie. When it premiered in 2013, S.H.I.E.L.D. was the most anticipated new series of its season. It met with a fair amount of critical acclaim and featured frequent tie-ins with the ongoing movie franchise. I found it an enjoyable but somewhat disposable entertainment: the early episodes felt cautious and non-essential, with a case-of-the-week structure, an appealing but rather anonymous cast, and an awkward need to serve a promotional role for whatever major theatrical release Marvel’s movie arm was cooking up. However, that latter function helped the show to make a startling leap late in its first season, when S.H.I.E.L.D. was destroyed in the course of the events depicted in the second Captain America film. The development highlighted some of the show’s quieter achievements, such its ability to build complex relationships among its various characters, and the fallout from that series of episodes helped to set in motion long-term conflicts that significantly raised the stakes and my emotional investment in those characters. Gabriel Luna as Ghost Rider. Still, Agents of S.H.I.E.L.D. has, like any good comic-book character, seemed close to or at the point of its demise, at least creatively, on a number of occasions. Ratings were solid but unimpressive, and the show was soon overshadowed by Marvel’s Netflix dramas, such as Jessica Jones and Luke Cage. Attempts at spin-offs featuring characters from the show never saw the light of day. It had a number of high points, but too often it kept reverting to a style that was competent but pedestrian. It was notable, then, when the show somewhat rebranded itself for Season 4, adding yet another subtitle onto its already unwieldy name. The first half of this season, which aired last fall, featured Ghost Rider, a fairly well-known Marvel character who had already appeared in a pair of creatively disastrous Nicolas Cage movies. It seemed an indication that the showrunners were casting about for a way to make the series more distinctive, a hint that cancellation might be in the offing should they fail. The Ghost Rider arc might not have done much to boost ratings, but it was a welcome change of pace for the show, especially with Gabriel Luna’s performance in the title role. The real innovation with the Ghost Rider arc was Whedon and Tancharoen’s decision to turn the show into a sort of mini-anthology series, with a recurring cast of characters who faced new threats taken from the vast Marvel comics universe. The move might have been a ploy to attract the attention of diehard comics fans, but it also had the virtue of chopping up the season into smaller, relatively self-contained stories that didn’t have to deal with the bloat and wheel-spinning that’s almost inevitable in a long-running network drama. That mini-anthology approach has paid off in the most recent arc, entitled “Agents of Hydra.” This arc has focused on a villainous android named Aida, played with chilling coolness by Mallory Jansen, who seems to have enjoyed the opportunity to play a surprisingly multi-faceted character. Aida has created an alternate virtual reality and entrapped the members of the S.H.I.E.L.D. team within it, changing important aspects of the show’s history. In this reality, Hydra, the sinister organization that serves as Captain America’s most dangerous adversary, has managed to take over the world, and a number of the heroes of S.H.I.E.L.D. find themselves unwittingly serving as loyal members. The alternate reality conceit has also given the showrunners the chance to bring back a range of former cast members, from lethal double agent Grant Ward (Brett Dalton) to fallen agent Antoine Triplett (B.J. Britt). Jason O’Mara, who joined the cast at the beginning of the season, has also given a fine performance as a wanna-be-superhero who’s placed in charge of the organization. Ming-Na Wen as Melinda May. The main cast has also benefitted from the change. Whedon’s always been a master at finding ways to use the serialized medium of television to showcase his actors’ range, using the conventions of the genres in which he works (primarily fantasy/horror and science fiction) to give performers showcases in which they can create, however briefly, starkly different versions of their characters. The “Agents of Hydra” arc shows that Tancharoen and Jed Whedon can do this, as well, particularly in the case of Gregg. Oddly, given the dark tone of the alternate reality in which his character is trapped, he’s operating in a looser, more comic role here, and change does him good, allowing him to get back to some of what made him so appealing to fans of the early Avengers movies. Iain de Caestecker, playing awkward scientist Leo Fitz, has also gotten a chance to branch out and endow his character, who rises to the head of Hydra in this virtual dreamscape, a new note of menace, and he’s matched by Jensen, who’s connected to Fitz in both worlds and whose cybernetic nature allows her to take on a number of different personae. Ming-Na Wen’s Melinda May and Henry Simmons’s Mack also get complicated, darker moments, as the former wrestles with her growing awareness of her complicity in hurting people and the latter confronts the fact that his beloved daughter, who’s dead in the real world but alive in this alternate reality, is no more than a digital illusion. As the return of so many former cast members indicates, there’s something of a last-hurrah feeling to this arc, which also plays out in the blatantly political overtones of these episodes. The alternate universe controlled by Hydra is a nightmarish one, and Whedon and Tancharoen seem determined to highlight every parallel, however tendentious, with our current political situation. Characters reference Hydra’s “alternative facts” and “fake news,” while Fitz utters the phrase “Nevertheless, she persisted” while lamenting the fact that his erstwhile friend and teammate Daisy (Chloe Bennett) has been resilient under torture. It feels heavy-handed, but it’s hard not to applaud their gumption and forthrightness. Nearly a decade later, I still bristle whenever I recall the praise that Christopher Nolan’s Batman film The Dark Knight garnered for the vague, confused allusions to Bush-era surveillance policies that it used to denote its own importance. S.H.I.E.L.D., by contrast, has managed to keep the tone light while still delving into some dark places. The creative team has done an excellent job with this arc of raising the stakes and heightening the tension but, this being a comic-book franchise, it seems inevitable that most of our heroes will emerge alive, if not unscathed. However, the same can’t be said for S.H.I.E.L.D. itself, as it looks increasingly likely that the show may be canceled after this season. If it is, I’ll be sorry to see it go, even as I quietly calculate the amount of time and space that its departure will free up on my DVR and in my personal life. If it has to go, it’s picked an especially high note on which to do so. I'd be SHOCKED if they cancel the show considering the Inhumans spinoff coming in the Fall and how successful it is overseas and on streaming services. Hell, it even sells well on TV/Digital. I know the Nielson-style ratings are atrocious but it's hitting a much bigger audience than that suggests and is good corporate marketing synergy for ABC-Marvel-Disney.